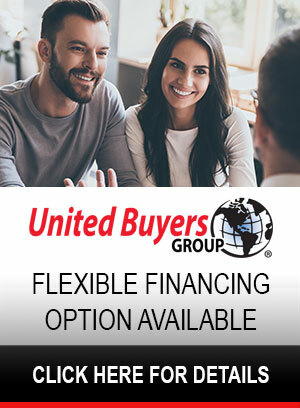 Homeowners come from Jackson CA, Pine Grove, Pioneer, Wilseyville, Lockeford, Martell, Drytown , Sutter Creek, and the surrounding area in Amador & Calaveras Counties to our fully stocked fireplace store to choose from the best collection of fireplace inserts. Cozying up to a brightly burning fireplace is the most popular way to warm up when the weather is chilly. Not only does a fireplace create a cozy warmth that family & guests can gather around, it also adds character to a home and provides spectacular sights & sounds that can't be match by other appliances. If you have a traditional fireplace with an open front and would like to use it but would also like to cut energy costs and be as environmentally friendly as possible, then a fireplace insert is the answer. While most of us enjoy a wood burning fire, a traditional open burning fireplace can lose up to 100% of the heat it products up and out of the chimney. Luckily, new innovations & engineering has created fireplace inserts, a great way to close off the opening of your fireplace and turn your traditional fireplace into a heating powerhouse. 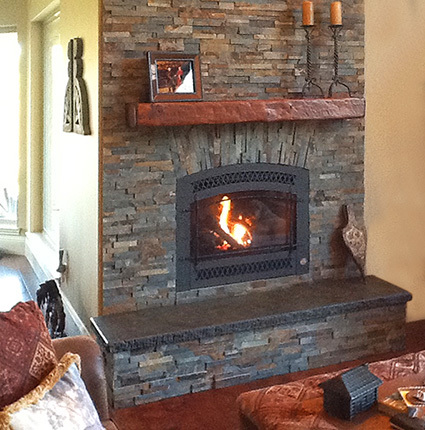 You can have all the beauty of a fireplace and lower your heating bills at the same time with a fireplace insert. Inserts can reduce your utility bills by acting as zone heaters and by reducing the loss of warm air up the open chimney of the fireplace. Fireplace inserts, whether they are wood, gas, or pellet fueled, are designed to increase the energy efficiency & heat output of an open-burning fireplace without diminishing its appearance & character. These smart, high-tech inserts are installed in the firebox of masonry and zero clearance fireplaces and create a closed combustion system which will increases the energy efficiency by 70% – 90%. Great news for any homeowner looking to rely less on central heating and slash winter heating bills, too. 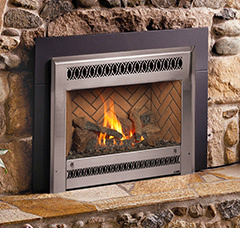 Fireplace inserts are constructed with heavy steel or cast iron with ceramic or tempered-glass doors. A pipe is used to vent by-products of combustion and decorative panels are used to cover up the rest of the fireplace opening. 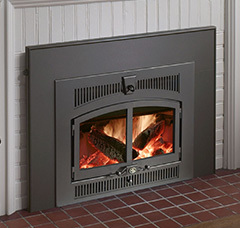 Sierra Hearth & Home has several sizes available, depending on the dimensions of your fireplace. Along with improving the efficiency of your fireplace, you can choose the fuel that fits your lifestyle. Traditional wood, easy to use pellets and ultra-clean gas inserts are all available. Wood inserts may mount flush with the opening of the fireplace, or sit out on the hearth a few inches to provide more radiant heat and an exposed top plate you can cook on, too. A typical wood insert can produce as much heat as a wood stove can. High-efficiency burn systems ensure maximum heat output from your firewood, allowing you to get more heat from less fuel. One of the best benefits of wood inserts is that they can operate during power outages, when you need the heat the most. Pellet inserts are great for eco-concious homeowners. They have the advantages of large fuel hoppers and built-in ignitors which make them extremely convenient & easy to use. By installing a pellet insert into your fireplace, you can transform your old, open burning fireplace into an attractive alternate furnace that will help you reduce heating costs & improve heat efficiency. Pellet burning fireplace inserts are efficient, eco-friendly heating appliances that fit into your existing fireplace and dramatically improve the heat output. Gas inserts are the cleanest and easiest to use, requiring a minimum of maintenance, and still provide reliable heat when the power goes out. Available in natural gas or propane models, these inserts can be as much as 80% efficient. By putting the heat right where you need it, you’re getting the best use of your heating dollars. Gas inserts are also your best choice for keeping your home free of ash and residue. 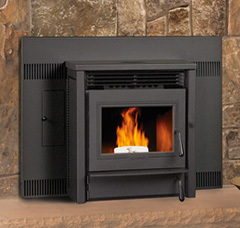 Sierra Hearth & Home carries a variety of wood, gas, and pellet models in our showroom. Our selection boasts some of the most innovative fireplace inserts on the market from the hearth industry’s leading manufacturers. Our factory trained professionals are here to help you find the best fireplace insert for your needs. Drop by to see firsthand how a fireplace insert can improve the appearance and efficiency of your fireplace!